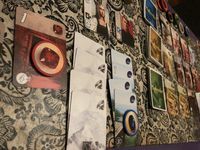 Hey everyone, I'm back with a review of one of the most played games in our household: Splendor by Marc Andre! Before we get into it, I'll remind everyone the meaning behind the word "Couple." This word can mean either 1. partners or 2. an indefinite small number. These reviews are a chronicle of multiple plays featuring my lovely girlfriend, Heidi, and myself. Because first few plays can be misleading, these reviews will always be written after multiple plays. In regards to Splendor, the times I have played number in the hundreds. Not enough time to read? Read the TLDR and then jump to the Play or Nay section. Art & Theme: I love the Renaissance gem merchants and use of actual historical figures. While the theme is not the most exciting, the art does a good job illustrating the processes involved in becoming a gem magnet. Components: The poker chip-esque gems are a delight to hold (and fiddle with when it is not your turn). The box could be smaller as there is a ton of extra space with the insert. Mechanics: The game moves quickly because of the simple turn structure (4 choices of actions / pick 1). Game: An easy game to pick up with enough depth for continued plays and frequently a close scoring game. 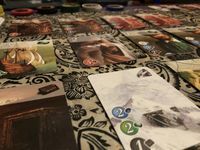 Splendor is a card drafting and set collection game for two to four players. Players will compete to collect gem coins to buy gem cards. These gem cards are divided into three different tiers of increasing benefit with greatest victory points earned at the highest tier. The gem cards give a player additional permanent gems to purchase other cards and victory points. Lowly beginnings make epic empires... if the cards are there. The only additional action from a turn is the gaining of nobles. Nobles are bonus victory points that a player gain as they achieve the amount of permanent gems needed to gain them. Once a player claims a noble, no other player may claim them. The last round is triggered when a player gets fifteen points. Play continues until all players have had an equal number of turns. The player with the most victory points at the end of the last round, wins the game. Splendor is a game that continues to surprise me after many, many plays. The layout of the board of gem cards and nobles creates a different play experience every time. Sometime the layout may dissuade the players from going for the nobles. Other boards may sway players to collect a certain color due to availability. And then there are games that have no rhyme or reason. Often there are multiple strategies hidden in one game. The variability of the games is one of the things that keeps me coming back to Splendor. The components ad art of Splendor are top notch. I often find myself rolling the poker chip-like gem coins between my fingers between turns. While the theme of gem trading is not the most entrancing, the art does a great job of extending the theme through the game as the gem transfers from the mine to the gemsmiths to the rich citizens of the city. Heidi and I both enjoy that the nobles are famous nobles of the century. Hello, Isabella of Spain and Machiavelli! Easy to learn mechanics make Splendor elegant. Wait time between turns is minimized by the one action per turn. None of the actions are difficult to understand. No action is damaging enough so that a player cannot recover. These elements make Splendor a fair game that anyone can compete in and win. The game we played surrounding this review was really close. I was a turn away from gaining my second noble and a third tier card that would push me over the fifteen points. A lot of no to low point cards and matching nobles convinced me to go that route. However, I missed that Heidi was racking up third tier cards that stacked well with the few cards she had. I only realized that she was going to win a turn before she grabbed her last third tier card. Splendor is definitely a strong Play. Simple turns and mechanics make a game that will entice new players. Complex changing strategies and card layouts will attract experienced players. Plays great with two thru four players and is a balanced two player game. I believe this is a game that can be put in front of anyone and would recommend bringing to your friends or family gathering. I loved this game from the first time I played it. I thought I’d fall out of love with it because of its simple nature. I could not have been more wrong. Even after several hundred games, Splendor is in our rotation. No game is a shut out with Heidi beating me often. With the expansion (which is also great), we have been playing it even more. I don’t see Splendor sitting on the shelf to gather dust anytime soon.